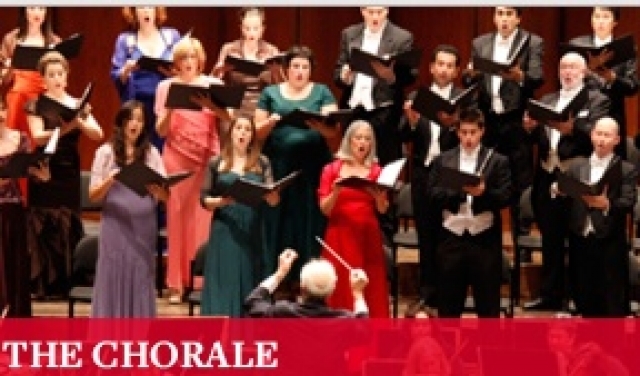 The National Chorale is celebrating its 50th anniversary season. 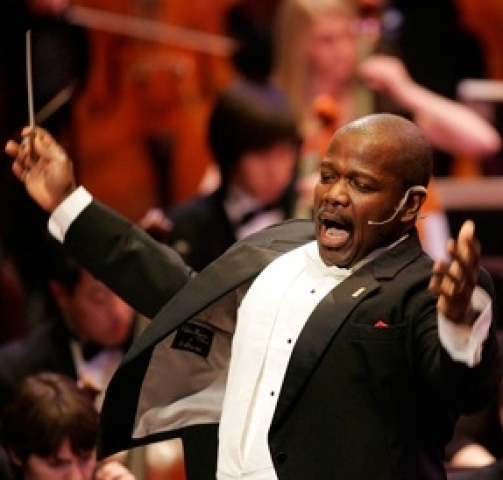 Its durability is clearly secured by the extraordinary singing under the direction of Artistic Director Everett McCorvey, a man of singular talents expressed both in his programming and the music he shapes from the singing voices and the small orchestra he assembled. The evening began with members of the chorus of the Professional Performing Arts High School, signalling the long-term commitment of the Chorale. The chorus clapped us into the moment with a selection from Leonard Bernstein's Mass, and then offered Somewhere from West Side Story and Make Our Garden Grow from Candide. Vagarshak Ohanyan conducted briskly and smoothly in a grey tux and tails, a surprising touch that got an enthusiastic response from his chorus. Bernstein's Chichester Psalms followed, with some members of the Chorale in bright green, red and purple dresses, gleaming against the golden wood of David Geffen Hall. These Psalms were in striking contrast to the other overtly religious composition of Bernstein's, the Third Symphony sometimes called Kaddish which is dark and pessimistic. Psalms is uplifting and exuberant, starting with the 108th Psalm of David and including the 23rd, which is quiet and gentle. The 108th gives the directive, "Awake...harp." This is taken up by Victoria Drake on the harp, and from there on out we have a delightful sense of rushing forward. Carl Orff composed Carmina Burana in 1936 and 1937. He based it on songs found in a Benedictine monastery near Munich, Germany. Puff Daddy produced a version which was not nearly as good as this one. Using only two pianos to represent the orchestra, McCorvey provided a full complement of percussion. This gave prominence to the rhythms which are the heart of the matter in Orff. Barry Centanni, timpanist, drove the songs with a steady beat to match a medieval mood brought forward into the now. He was joined by Frank Cassara, Eric Borghi, Min Hie Ju, and Taylor Goodman on chimes, cymbals, xylophone, clappers and maybe even scrapers. Above the fray, McCorvey wove beautiful lines. Driven by the beat to be sure, lines were dynamically directed and given an emotional arc. Baritone soloist Jonathan McCullough, who was splendid in the world premier of Elizabeth Cree, brought a warm tone and dramatic presence of each of the words he sang. The sections are titled Spring, In the Tavern, and Love. While some scholars think the songs were written by a defrocked monk, others think that young men who were giving up worldly pleasures wrote a final farewell to them, contemplating what they were giving up. Spring dawns and the earth is dappled and wreathed with blossoms. The question is raised: To be chaste, or not to be chaste. The piece answers this question clearly. Only someone who had Sunday lunches with the Harvard Classic University professor, Werner Jaeger, and spoke Latin all during the meal, could appreciate the raunchiness of the language. Veni, veni, venias are an enticement to indulge. McCullough sings of giving in to vice, heedless of virtue. 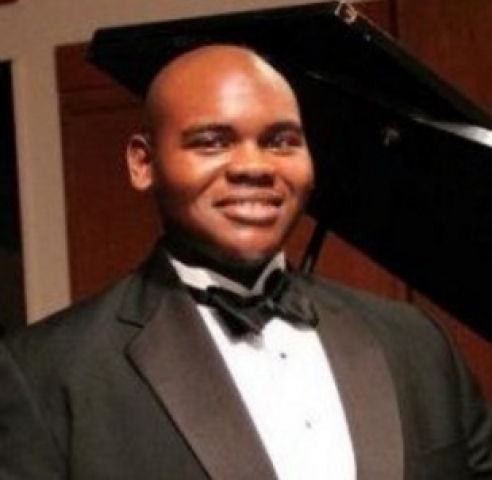 Matthew Truss, a countertenor who teaches at Boston's Berklee School of Music, had a tough test. He is a swan dying as he roasts on a spit. Truss stood still as his entrance approached. His arms were spread like a swan's wings. His voice is both piercing and sad. He ranges high, even for a countertenor. Love is not simple. It provides access to excess and an inside burning with desire. McCullough sings of unlocking a girl's virginal chains. When she permits this, glorious soprano Elizabeth Caballero sings higher than we can imagine. She is that "precious girl," as her lover Bachelleur calls her. "I am yours," she sings out. We certainly belong to the soloists, chorus, conductor, pianists and percussionists that gave us such a rollicking performance.